a book chick: "White Teeth"
my take: Every so often while reading I had to look back to the publishing date to double check that this was written before 9/11. Although this took me waaaaay too long to read (thusly ruining my book schedule), I found White Teeth enormously engaging and eerily relevant to today's immigration and terrorist situation. Archie Jones and Samad Iqbal meet during WWII fighting for the British and bond over a horrific incident. Their friendship lasts through the decades and is a stage for Ms. Smith to interject nearly every subject known to humankind: culture, religion, race, marriage, poverty, immigration, colonialism, intellect, siblings, twins, parenting, politics, nationalism, identity and more! Seriously, this is nearly as all-inclusive as Billy Lynn's Long Halftime Walk. The narrative jumps from past to present and throws a wide net to catch a crazy cast of characters, and, with a bit of wrangling, ties all the disparate bits and bobs into the final scene. 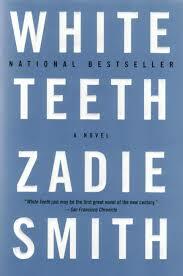 Witty, sarcastic, prophetic, instructive, surprising, White Teeth has it all going on. my source: prepping for The Festival of Faith and Writing: My mother read this years ago and doesn't remember liking it; I read On Beauty years ago and don't remember especially liking that. We're each reading the other to be ready to hear Ms. Smith speak at FF&W at Calvin College in April. And liking our new selections. Go. Figure.